Look, Julia. I don’t know your life. Maybe everything is going great. But if you’re super stoked about the Jonas Brothers making music again, it kind of seems like you’re just yearning for the simpler times of 2008. And who can blame you? Obama got elected! That’s pretty much the opposite of what we got going on right now. Low by T-Pain and Flo Rida was topping the charts and I bet you could be found in at a dance in a gym with a strobe light, not thinking about the impending doom of tomorrow. Slumdog Millionaire came out. Twilight came out. Hugh Jackman was the sexiest man alive. THE SPICE GIRLS WERE STILL TOURING. I get it. Maybe a Jonas Brothers song was your ringtone on your, let me guess, Motorola RAZR that was the worst kind of pink? I’m sure you have fond memories. That’s great, Julia. Hang onto those. 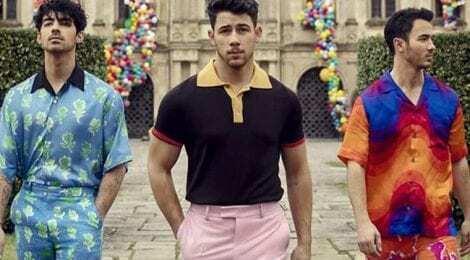 And I hate to be the one to break it to you, but just because the Jonas Brothers are releasing music again doesn’t mean that sense of innocence is returning to you. I’m just worried about you, is all. I know things aren’t going great. I know Nick Jonas’ wedding hit you pretty hard, and not just because their engagement photos went up the day Steve said he was leaving you. Did you really think just because you still have his poster in your room he was going to marry you? Pull it together, Julia. You’re 25.